Renowned Danish urbanist Jan Gehl often states, “First we shape our cities, and then our cities shape us.” Grand Rapids currently stands in a precarious position with much to learn about real city building. Right now, one foot is firmly planted in “the way we used to do things,” and the other is taking its first steps towards becoming a legitimate urban place. Both feet need to be placed into this emergent future as we shape the city into a flourishing metropolis. During the 20th Century, Grand Rapids entered into her urban adolescence and was shaped by auto-centric policies and grand design administered far above the very citizens that it impacted. These massive initiatives dismantled the city’s livable urban fabric through the insertion of elevated highways, seas of asphalt parking lots, overly-wide single-use arterial roads and sterile sequestered buildings, parks and plazas. This resulting cityscape has shaped all of us by coercing false expectations of unencumbered motoring and free parking, while also lowering our expectations of what our city can achieve in her evolution. In many of our places and spaces, mediocrity has filled the voids left by the absence of prosperity, livability and activity — and the wherewithal of the citizen base to remove it has oftentimes been overrun with contradictory policy and provincial thinking. At the dawn of the 21st Century, Grand Rapids is emerging from this languid urban adolescence, and her citizens and leaders have the opportunity, and responsibility, to transform her into a thriving and prosperous maturity. We have made major strides to begin to shape our city into a premier location through public and private leadership. Economic development like Health Hill and the Downtown Market, and initiatives like ArtPrize and Laughfest, increased transit investment and ridership, and visionary master plans all have begun to lay the framework for this emergence. It is now time to align these investments and stated values with implementation. It is time for our actions to match our words. 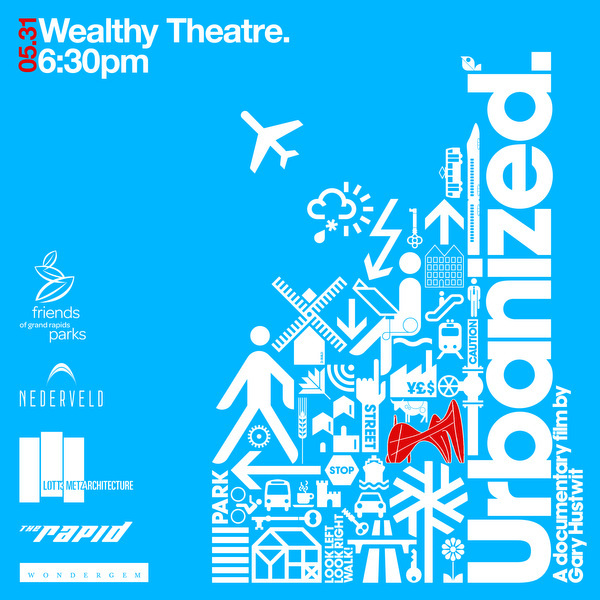 Next Thursday, May 31, Gary Hustwit’s documentary Urbanized will be shown at Wealthy Theater. Sponsored by a group of committed local urbanists, this free event will share knowledge, elevate a more sophisticated dialog and ultimately inform good city building actions. The film speaks to how we need to think about Grand Rapids as she evolves from her adolescence to an adulthood of robust and livable urbanism. Urbanized inspires us to use our actions to shape our city, so that we can live, work, recreate, learn and move in a place that invigorates, elevates and dignifies our experiences. Urbanized reinforces the notion that great places are the result of informed actions, no matter how small or seemingly inconsequential these actions first appear. It tells us that we need to fight the urge to design from above and instead design for people and place at the micro-scale through participatory and place-centered initiatives. The documentary inspires a heightened awareness of the powerful impact that design at all scales can have on our daily lives. The conversation will need to continue, and as part of that dialog, we need to not be afraid to challenge the conventions of the past. We need to have the fortitude to not settle for mediocrity in our city building, while having the courage to ask the hard questions. Urbanized. For the future. For Grand Rapids. Mark F. Miller is an architect and urban designer at Nederveld. Nederveld along with Lott3Metz Architecture, Friends of Grand Rapids Parks, The Rapid and Wondergem are sponsoring this free event for the community.